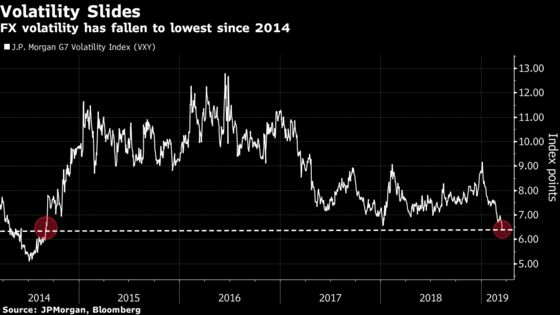 (Bloomberg) -- Only a crisis is likely to awaken market volatility from its deepest sleep in more than four years, according to strategists. A JPMorgan Chase & Co. measure of price swings in global currencies has dropped to the lowest level since September 2014 as the world’s largest economies show signs of slowing and global central banks signal caution in terms of their future monetary policy. With officials on hold, and few interest-rate increases forecast this year, volatility in the $5.1 trillion-a-day foreign-exchange market has been suppressed. Still, the tranquility may not last forever, according to MUFG Bank and Russell Investments. They cite such possibilities as a hawkish turn by the Federal Reserve, a Chinese slowdown and a U.S. recessions as events that could rouse currency markets from their slumber. There is no point having a long volatility strategy just yet, MUFG said. In 2014, volatility was sapped from currency markets as central banks from Japan to the U.S. found themselves maintaining stimulus to prop up the economy in the wake of the financial crisis. That didn’t change until the Federal Reserve began to signal that it would be the first to raise rates, doing so in December 2015. For Russell, investment strategies that follow foreign-exchange trends will also benefit from a “proper crisis” because commodity and cyclical currencies, such as the Australian dollar, would sell-off having traded in very narrow ranges recently. “If we had a big crisis possibly caused by the onset of the U.S. recession, you would see big draw downs” in those currencies, said Van Luu, head of currency and fixed-income research at Russell.